There has been a great deal of debate about the teaching of IT and whether we should have much more of a focus on Computer Science. The Rasperry Pi ultra low cost computer could allow us to relive the days of the 1980's BBC Micro and allow all school children to experiment with writing simple code and to build computer projects. But hang on a minute, of course we need to produce more budding engineers and computer scientists and give them a low cost platform to experiment on, however if they don't understand or feel comfortable with maths, specifically Geometry and Algebra then they will not be able to progress and write the code that they need. Today many children who are bright and entrepreneurial really don't enjoy their maths. A small group of dedicated people believe that if children could 'see' and interact with Geometry and Algebra then they would 'get it'. So for the last four years they have been developing a software tool and International community platform that allows students to easily visualise their maths problems and to develop solutions that they can share locally or globally. Now of course people have developed maths tools before and many of them are very good, but this tool has something quite special about it which is best defined by how it was created and the viral way it is spreading. Its creator, Markus Hohenwarter, started the project in 2001 at the University of Salzburg, continuing it at Florida Atlantic University (2006–2008), Florida State University (2008–2009), and now at the University of Linz together with the help of open-source developers and translators all over the world. A key moment in time was when Markus and Zsolt Lavicza met at a conference in Hungary in July 2004. At the conference they were offered fish soup, neither liked it so decided to go and find somewhere else to eat and of course started to chat over their meal, it was then that they discovered their common interest in finding a better way to teach and learn maths. As Zsolt said in a recent interview, "We started to talk and we just continued talking over the years". In May 2008 they held their first meeting of the 'International GeoGebra Institute' at the University of Cambridge's Faculty of Education in the UK. Around 30 people came from 20 different countries. What quickly became clear was that they all wanted to have their own GeoGebra Institutes and within months there were another 15, today there are 97 and they are growing at an exponential rate. Volunteers have translated the software into over 40 languages and have also written text books and guides. A great Youtube channel has been created and there are videos which have been uploaded by users illustrating how to use the tool. The software is very popular in France, with advocates such as Daniel Mentrard setting up web areas. He and many other teachers share their worksheets on GeoGebraTube. This area is fast becoming the place for users to share GeoGebra materials and the worksheets from there will now also run on tablets and smartphones. The team have created user-forums and support groups and their FREE software is currently being downloaded 500,000 times a month! There is of course also a Wikipedia page. 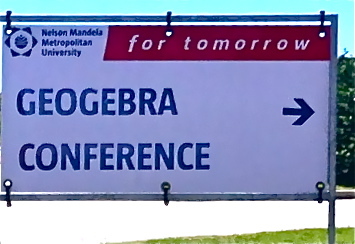 In early April 2012 one of the team visited South Africa and was hosted at the Nelson Mandela Metropolitan University. At the university the software was shown to local teachers who immediately saw the potential of the tool and were keen to use this with their students and to tell others in the South African teaching community about their experience. With the software being adopted quickly and by countries all around the world, you will not be surprised to see that they have won several major awards over the last four years. So with this fantastic growth and enthusiastic support from the thousands who use it, why have you never heard of it? The team is small and mainly volunteers so they focus on areas where there is a real hunger for a new way to teach and learn maths and where the local communities and authorities are open to a step change in thinking. That said the viral message is spreading and I discovered this week when chatting to a friend at MIT who had not heard of GeoGebra that when he later spoke to his son about it he discovered that his son's school in Newton Massachusetts are, through a pioneering teacher, using the software with students although it is not officially part of their curriculum yet. Recently a new opportunity has opened up and GeoGebra team are busily making the most of it, which brings me nicely back to the Rasperry Pi computer. Through a UK champion and fervent supporter , Adrian Oldknow, they have made contact with the Rasperry Pi team in Cambridge and are creating a version of GeoGebra that allows Python programming within GeoGebra. To allow the GeoGebra software to run with the Rasperry Pi straight away the team have developed a quick fix which is available now. (The details are on their forum pages). As the Rasperry Pi computer finds it's way into schools and homes it will take with it this new way of understanding the maths which budding Engineers and Scientists will need when they start to write more complex programmes. So what next for this dedicated and extraordinary group of people? GeoGebra version 5 will include a 3D graphics view that will provide interactive 3D geometry. The team are also working on an export for 3D printers, so that students can produce 3D models and can see their maths really 'coming to life". Their next challenge is to take the feedback and interaction they are getting from their ever growing community, through the portal they have created and to enhance the software so that students and teachers can make the most of this revived interest the key subject of Mathematics.